12/29/16: Dryer fire causes residents to be evacuated at Rae-Ann Skilled Nursing and Rehabilitation Center in Geneva, OH. 12/29/16: Dryer fire destroys home in Peru, Indiana. 12/8/2016: Clothes dryer fire forced 18 people from their apartment building in Manchester, New Hampshire. 11/1/16: Dryer fire at the Victorian Inn and Suites required everyone in the building to evacuate. 10/26/16: A fire official said the fire which destroyed the home of a Forreston family last week started in the clothes dryer. 7/1/15: Lint in an industrial dryer catches fire, and a first-responder has words of warning about laundry and unintended blazes in the summertime. 5/18/15: A Tennessee family is displaced after a fire, blamed on lint, and learns the hard way. "I’m really bad to turn my dryer on and go to bed,” Karen said. “But no more of that. This just goes to show you how quick anything can happen.” Read more. 3/19/15: Clothes dryer fires are a real threat. Here's a roundup of recent fires in the past few days. 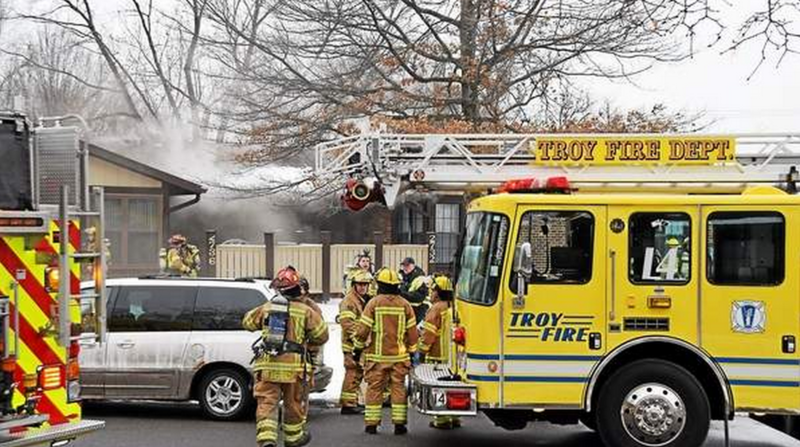 Firefighters were called on Saturday to a fire started in the basement dryer of a condo in the 2700 block of Roundtree Drive in Troy. Photo by Daniel Jasina, the Oakland (Mi) Press.